Texas based crossover thrash icons M.O.D. (METHOD OF DESTRUCTION), have announced their first studio album in 10 years! Busted, Broke & American is set for release on July 7th via Megafroce Records. 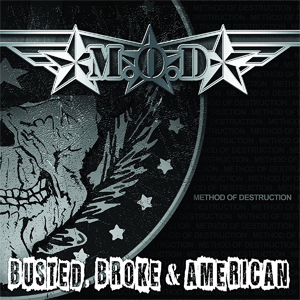 Busted, Broke & American is not only the folloup to Red, White & Screwed (2007), but it also marks a return for the band to Megaforce, who released a few of the band's albums, including their 1987 debut effort, U.S.A. for M.O.D.. You can pre-order the abum now in the KNAC.COM More Store HERE. A video trailer featuring vocalist Billy Milano (S.O.D.) can be viewed below. "Shattered Dreams & Broken Glass"